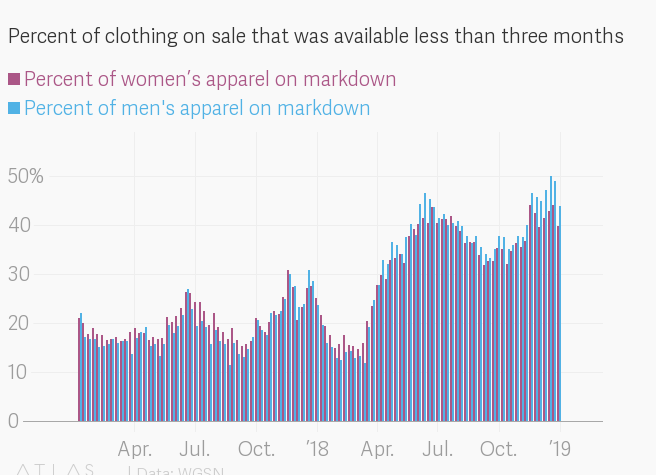 Shoppers in the US can probably think of a few fashion retailers that seem like they’re permanently on sale, their racks packed with clothes that nobody wanted at full price and struggle to move even at a discount. Far from being isolated among a few troubled retailers, the problem has ensnared a large swath of the industry. At a recent presentation in New York, Nivindya Sharma, director of retail strategy and insights for WGSN Analytics—the data division of global trend forecaster WGSN—explained some of the forces that have contributed to this state of affairs. Among them is a fundamental shift in the relationship between supply and demand, spurred by the spread of e-commerce, social media, and the new shopper behavior they’ve encouraged. “These are big, momentous changes,” Sharma said. The best way forward, according to a white paper presented by Sharma and WGSN, is for brands to get smarter and more flexible about when they drop new products, and to find ways to stand apart from the rest of a very crowded, largely undifferentiated marketplace. The issue of endless discounting is a big one for brands. It cost them some $300 billion last year, according to one estimate. It squeezes their margins, and over time, chips away at their cachet. Yet many continue to offer bigger and earlier discounts on their products. WGSN analyzed the US e-commerce operations of 57 womenswear retailers and 50 menswear retailers and found that the number of discounts on current season products—defined as those available for less than three months—grew significantly in just the last two years. In the past, fashion was largely a supply-led market, meaning brands and retailers put the products they wanted into stores, on schedules they chose. Consumers then bought up what was available at the shops they had access to. An example is the way coats and jackets for fall and winter started arriving in stores at the end of the summer, long before the weather turned cold. But after the internet came along, in particular social media and e-commerce, shoppers gained instant access to a wealth of information and choices. Consumers today can shop anywhere and compare prices on anything, amplifying the competition among brands for their dollars, while a steady stream of images and products in their social feeds drives a ravenous desire for new stuff that they expect brands to satisfy immediately. Demand, not supply, has become the controlling force. This change has put brands in the position of always trying to keep up with an appetite for newness, but many still haven’t figured out how to do it efficiently. Often the long lead times of their supply chains mean they still have to produce huge amounts of clothing months in advance to fill their shops, leaving them guessing far ahead of time what shoppers will want, and not always accurately. They can get stuck with large and costly amounts of overstock, such as the $4 billion pile of unsold clothes that H&M had at one point last year. Over the past several years, brands have leaned on markdowns to clear that extra stuff. But in doing so, they’ve led shoppers to expect regular sales. Analysts believe the Great Recession was also a major factor in this pattern of behavior. Many people now buy only when a product is discounted, cornering brands into offering earlier and bigger deals to keep them interested. The way out of this situation isn’t easy. To be competitive, brands still need to feed that appetite for new products, but in a way that doesn’t leave them with a big pile of unsold clothes. Some of fast fashion’s digital upstarts have been adept at this, and WGSN noted it’s seeing more brands dropping new products closer to season. Brands also need to get shoppers excited about their releases, an ability some streetwear labels have excelled at, and find ways to stand out from the pack. Shoppers have a sea of options to choose from, and many are less concerned about the brand than getting what they want at the best price—part of the reason retailers’ private labels have been so successful. Sharma pointed out that young shoppers in particular tend to search by product, rather than seeking out specific brands. Companies have to offer shoppers a clear reason to choose them, such as their sustainability credentials or other differentiating qualities, if they want to get their attention, especially at full price.